Hyundai has added another video to its campaign promoting new OEM collision parts, the company announced Thursday. 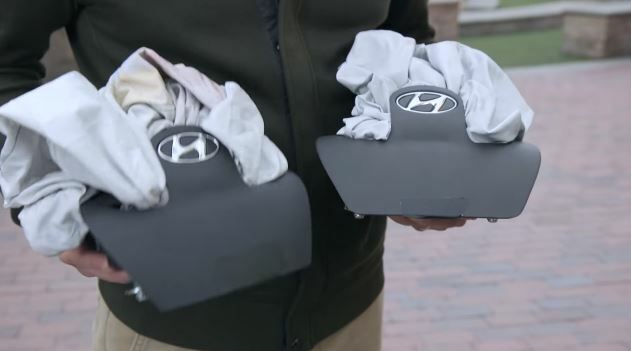 The video “Good to Know – Counterfeit Parts” on YouTube and Hyundai’s Consumer Awareness site points out serious deficiencies in a counterfeit airbag installed in a 2011 Honda Sonata. Posted on YouTube on Sept. 7, it had 925 views as of Friday afternoon. 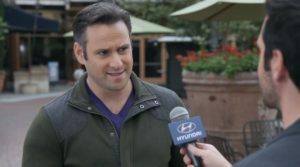 In the film, a Hyundai interviewer asks “Scott” (actor Jason Adler) to evaluate two airbags, both stamped with the Hyundai logo. “Aren’t they both airbags?” Scott asks. “Yes, you’re right. But they’re not the same,” the host replies. If an airbag deploys that’s not “a Hyundai genuine part that’s been tested to meet safety requirements, you risk injury, or worse,” the interviewer states. Crash-test footage shows the fake Hyundai Sonata airbag failing, and a narrator warns that customers won’t always get a Hyundai part in a repair. “I didn’t know that two parts that look so similar could make such a huge difference,” Scott says. “Did you know that often times, you have the choice to request Hyundai Genuine Parts if you’ve been involved in an accident?” the interviewer asks. “No, I had no clue. That’s good to know,” Scott says. Since the airbag referenced is truly counterfeit — it is fraudulently representing itself as the real deal, including the Hyundai logo — the video is a little confusing. Seen alone on YouTube, the film seems to imply body shops are abetting the criminal copies, putting them on cars willy-nilly unless the vehicle owners think to ask for a non-counterfeit part. That’s not exactly Hyundai’s point. Besides truly counterfeit parts, Hyundai is criticizing the legal but still controversial practice in collision repair and DIY fixes of imitation aftermarket parts. (And remanufactured and used parts, too, though those were at least from Hyundai when they were new.) . The OEM is arguing that based on the illegal counterfeit Sonata airbag that looks identical to a Hyundai part but malfunctions, a legal generic (or salvage) part that fits on a Hyundai might not work well either, and it’s warning customers that insurers and shops might not have their best interests at heart. “Yes, the point of the video is to educate customers about their right to demand Hyundai genuine parts and the consequences of not doing so, as any non-Hyundai genuine part is not going to perform as intended and will not have the same the fit, finish and quality as Hyundai genuine parts,” Stroup said. OEMs over the past year have campaigned against aftermarket and recycled parts, including Hyundai’s earlier film and one from GM this summer.